[144 Pages Report] The image sensor market is expected to witness high growth during the forecast period. The overall market is expected to grow from USD 12.78 Billion in 2016 to USD 24.80 Billion by 2023, at a CAGR of 9.75% between 2017 and 2023. The base year considered for the study is 2016, and the forecast period provided is between 2017 and 2023. The objective of the report is to provide a detailed analysis of the market based on technology, processing type, spectrum, array type, vertical, and geography; and information regarding the major factors influencing the growth of the market (drivers, restraints, opportunities, and challenges). Moreover, the objective of this report is to strategically profile key players and competitive landscape for market players, and provide information on product launches, acquisitions, partnerships, agreements, and collaborations in the image sensor market. 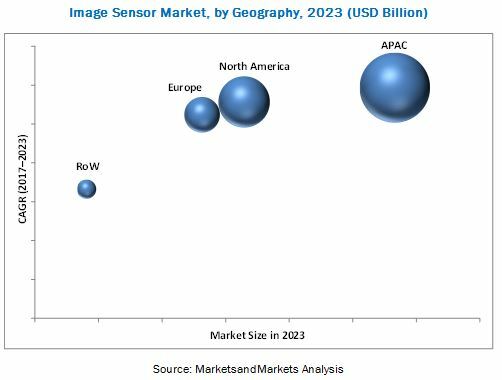 The research methodology used to estimate and forecast the size of the image sensor market begins with obtaining data on key vendor revenues through secondary research. Some of the secondary sources used in this research include information from various journals and databases such as IEEE journals, Factiva, Hoover’s, and OneSource. The vendor offerings have also been considered to determine the market segmentation. The bottom-up procedure has been employed to arrive at the overall market size for image sensors from the revenue of the key players. These data triangulation and market breakdown procedures have been employed to complete the overall market engineering process and arrive at the exact statistics for all segments and subsegments. The analysis of the image sensor market includes extensive primary research to gather information, verify, and validate critical conclusions arrived at after an extensive secondary research. After arriving at the overall market size, the overall market has been split into several segments and subsegments. The following illustration shows the breakdown of primaries conducted during the research study on the basis of company type, designation, and region. The ecosystem for the image sensor market comprises manufacturers such as Sony (Japan), Samsung (South Korea), OmniVision (US), On Semiconductor (US), Panasonic (Japan), Canon (Japan), SK Hynix (South Korea), STMicroelectronics (Switzerland), Pixart Imaging (Taiwan), PixelPlus (South Korea), Hamamatsu (Japan), ams (Austria), Himax (Taiwan), Teledyne (US), and Sharp (Japan). The image sensor market was valued at USD 14.19 Billion in 2017 and is projected to reach USD 24.80 Billion by 2023, growing at a CAGR of 9.75% between 2017 and 2023. Major factors driving the growth of this market include the increasing penetration of image sensors in automobiles, the trend of miniaturization and dual camera in smartphones and tablets, and the demand for improved medical imaging solutions. This report segments the image sensor market on the basis of technology, processing type, spectrum, array type, vertical, and geography. The image sensor market for CMOS technology is expected to hold the largest share by 2023. CMOS image sensors are preferred over CCD sensors owing to small size, low power consumption, ease of integration, faster frame rate, and lower manufacturing cost. Advancement in the CMOS image sensor technology has improved the performance of image sensors, which have increased the penetration of the CMOS technology in consumer electronics. Lower selling price and enhanced performance have boosted the market for the CMOS technology. The 3D image sensor market for image sensors is expected to grow at the highest CAGR during the forecast period. 3D image sensors find its application in fast-growing applications such as ADAS, machine vision, and computer vision. Another driver that is expected to drive the market for 3D image sensors is artificial intelligence in smartphones. Some companies, such as Apple, are already working on the inclusion of 3D image sensors in smartphones, and other smartphone manufacturers are expected to follow the same trend. The market for non-visible spectrum is expected to grow at the fastest rate during the forecast period. The market for non-visible spectrum is gaining traction owing to its increasing use in automotive, medical, consumer electronics, and industrial applications. Asia Pacific (APAC) held the largest share of the image sensor market. APAC is the largest market due to the fact that more than 80% of the demand for image sensors is coming from the consumer electronics application, which includes smartphones and tablets, cameras, computers, and wearable electronics. The global image sensor market is growing at a faster pace, but there are some restraints that are yet to be addressed. The higher manufacturing cost of image sensors is restraining the growth of the image sensor market. Images captured using low-megapixel cameras have numerous drawbacks. The image quality of such images gets reduced while zooming in, cropping, or taking prints. Hence, the demand for high-megapixel cameras is growing. To increase the number of pixels, manufacturers either have to increase the chip size or shrink the pixel pitch, as a result, inhibiting the growth of the image sensor market. Key players in this market are Sony (Japan), Samsung (South Korea), OmniVision (US), On Semiconductor (US), Panasonic (Japan), Canon (Japan), SK Hynix (South Korea), STMicroelectronics (Switzerland), Pixart Imaging (Taiwan), PixelPlus (South Korea), Hamamatsu (Japan), ams (Austria), Himax (Taiwan), Teledyne (US), and Sharp (Japan).